It's important to follow safety guidelines when you use a rotary cutter. Rotary cutting tools help us cut fabrics and assemble quilts and other projects in record time, but rotary cutting is a technique that can cause injuries if basic safety guidelines aren't followed. Don't be afraid to use rotary cutting methods, but do become familiar with what you should and should not do before you pick up that first cutter or attempt to change a blade. Get into the habit of closing your rotary cutter's safety latch every time you put the cutter down. If you leave the shield open I guarantee that someday you'll brush your hand against it and get cut. Every manufacturer makes a slightly different type of safety latch, and some rotary cutter blades automatically retract when you release pressure on the trigger after cutting. Try out several cutters to discover which types have safety devices that are easiest for you to manipulate -- some quilt shops have rotary cutters set up on a cutting board so that quilters can experiment and inspect the tools. See How to Choose a Rotary Cutter for more info. Rotary cutter blade replacement techniques differ from one cutter to another. Many cutter blades are replaced by removing a nut and washer to access the old blade. The process is reversed after slipping the new blade in place. Handle both the old and new blades carefully during replacement. The new blade may not cut fabric anymore but it will still cut fingers. Keep your new rotary cutting blades in a safe place, one you're sure kids and pets can't find. Don't unwrap the original packaging until it's time to install the blade. Even dull rotary cutting blades are sharper than most knives and can cause serious injury to someone taking out the trash. Many replacement blades come in plastic containers. Keep the containers and put your used blades in them for disposal. Wrap some duct tape or packing tape around the container for a bit of extra security. If you don't have a case, wrap blades in layers of heavy paper and then carefully surround the paper with thick tape before disposing. The rotary cutter should always roll away from your body. Never attempt to cut 'backwards,' towards yourself. It's just too dangerous. Move the fabric and make cuts the safe way. Learn how to rotary cut fabric. Do not hold a ruler with your left hand and cross over the ruler with your other hand to cut on the ruler's left side. There's too much risk of injury to your arm and fingers when you attempt that type of rotary cutting maneuver. A right-handed cutter holds the ruler steady with the left hand while cutting down the right side of the ruler. Lefties reverse the process, securing the ruler with the right hand and cutting along the ruler's left side. Keep fingers away from the ruler's edge and out of the path of the cutter. Put fabric grips under the ruler to keep it from slipping around on the fabric (different types of grips are available commercially). Tools such as Rule Steady (a personal favorite) are available, and keep the ruler from moving while they protect fingers. Don't attempt to rotary cut with a typical rotary cutter while sitting down. You can't hold the ruler or the cutter correctly in that position, and it's a scenario that leads to accidents. Some quilters report that Maretelli's Ergo cutter works nicely from a sitting position, so it might be a good choice for a quilter who cannot stand. Shop for Martelli's Ergo cutter on Amazon.com. How to Choose the Best Rotary Cutter for Your Needs. Rotary rulers and mats are designed specifically for use with rotary cutters. Regular rulers do not have the depth that's required to keep the blade running alongside the ruler -- away from your fingers instead of skipping across the top and across your hand. Make cuts on a surface not meant for rotary cutting and you'll end up with damaged furniture, nicked blades and quilting fabrics that scoot all over the place when cut. Make your blades last longer by keeping your rotary cutting mat clean. Use your rotary cutter for the tasks it was created for. The blade isn't a handy screwdriver. The heavy circular top isn't a small hammer. Both suggestions may sound silly, but we sometimes grab the first thing we see when we need a tool that's not nearby. Use your cutter for the jobs it's meant for, follow all of the safety guidelines, and you'll have more fun cutting fabrics than you ever thought was possible. 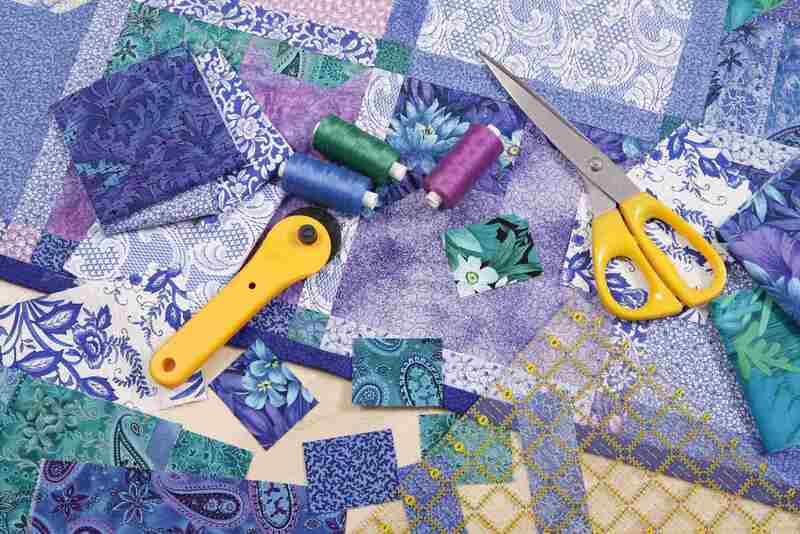 Learn more about rotary cutting tools for quilters and find out how easy it is to rotary cut patchwork shapes.